After winning two matches back to back, Jamaica Tallawahs is all set to take on St Kitts and Nevis Patriots on Wednesday, August 15, 2018. In Today’s Dream11 Fantasy Cricket Match of SKN vs JAM 8th T20, CPL 2018, we will cover Probable Playing XI, Pitch Report of Sabina Park, Kingston, Jamaica, Toss Prediction, Fantasy Cricket News and Tips and Who Will Win? Who Will Win the 8th T20 Match, Between SKN vs JAM and Toss Prediction? Where Can You Watch the Live Streaming of JAM vs SKN, 8th T20 or Channels to Watch? Jamaica Tallawahs has played two matches and both. They are in the top position of the points table with four points in their pocket. On the other hand, St Kitts and Nevis Patriots have played two games, won one and lost one. They are in the 5th position of the points table with 2 points. According to our astrology prediction, JAM will win the match. The team winning the toss should opt to bowl first as chasing a score will easy. According to our astrology prediction, JAM will win the toss and invite SKN to bat first. 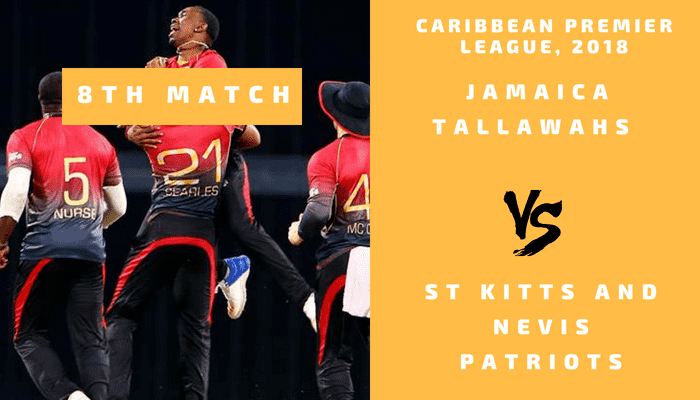 Match: Caribbean Premier League, 2018, JT vs SNP, 8th Match. Venue: Kingston, Jamaica, Sabina Park. Time: 11:00 PM GMT, 04:30 AM IST, 06:00 PM LOCAL. The pitch of Jamaica, Port of Spain will favour all the three departments. The one who will bend their back the most will be benefited the most. The seamers will get help in the first couple of overs, the spinners will get help in the middle overs and the batsmen will get assistance throughout. However, the wicket will be batting-friendly. It will be partly cloudy in the morning. In the second half of the day, it will be mostly sunny. The sky will be clear and no rain is expected. It will be a hot and humid day. The temperature is expected to be 29-Degree Celsius and the humidity to be 66%, which may go up to 76%. Note: The weather condition will support the batsmen and spinners. If we look at the statistics of last five matches, Jamaica Tallawahs has won three matches out of five matches whereas St Kitts and Nevis Patriots have won two games out of five games. In the last encounter, JAM defeated SKN by 41 runs. R Powell, K Santokie, O Thomas and GD Phillips were the key performers of that match. The average first inning score of this ground is 134. The average second inning score of this ground is 132. Highest total on this ground is 194/1 in 18.3 overs by WI vs IND. Highest total chased on this ground is 194/1 in 18.3 overs by WI vs IND. Glenn Phillips, Rovman Powell, Andre Russell, Oshane Thomas and Adam Zampa are the key players of Jamaica Tallawahs Team. Oshane Thomas may retain his place as he took three wickets in the last match. Ross Taylor has not performed till now and this may is a concern. Jamaica Tallawahs may play with the same playing 11. Glenn Phillips is one of the most important and key players of JAM. Glenn Phillips (wk), Adam Zampa, Johnson Charles, Kennar Lewis, Imad Wasim, Andre McCarthy, Krishmar Santokie, Ross Taylor, Andre Russell (c), Rovman Powell, Oshane Thomas. Andre Russell (c), Glenn Phillips (wk), Steven Taylor, Johnson Charles, Elmore Hutchinson, Andre McCarthy, Samuel Badree, Rovman Powell, Steven Jacobs, Ross Taylor, Adam Zampa, Kennar Lewis, Jermaine Blackwood, Imad Wasim, Kemar Roach, Krishmar Santokie, Kirstan Kallicharan, Oshane Thomas. Devon Thomas, Chris Gayle, Carlos Brathwaite and Ben Cutting are the key players of St Kitts and Nevis Patriots Team. Evin Lewis form may be a huge disadvantage for St Kitts and Nevis Patriots Team. S Cottrell will be a key seamer for SKN. SKN may play with the same playing 11. Evin Lewis, Sheldon Cottrell, Chris Gayle (c), Jeremiah Louis, Tom Cooper, Anton Devcich, Ben Cutting, Devon Thomas (w), Mahmudullah, Sandeep Lamichhane, Carlos Brathwaite. Devon Thomas (wk), Alzarri Joseph, Chris Gayle (c), Hayden Walsh, Evin Lewis, Brandon King, Tom Cooper, Carlos Brathwaite, Anton Devcich, Ibrahim Khaleel, Mahmudullah, Sandeep Lamichhane, Ben Cutting, Fabian Allen, Jeremiah Louis, Javelle Glen, Sheldon Cottrell, Shamarh Brooks. Conclusion: This is it for Today’s Dream11 Fantasy Cricket Match Prediction of SKN vs JAM, 8th T20 Match, which will be played on Wednesday 15th August. We have covered all the details required to win any fantasy leagues. We have covered players recent and past performance, dream11 guru and crictom prediction, all the latest news and updates of Jamaica Tallawahs Team and St Kitts and Nevis Patriots Team, weather report of Jamaica, dream 11 best teams, keys players, the best choice for captain and vice-captain, where to watch the live match of JAM vs SKN, 8th T20 Match and the details of live streaming of Caribbean Premier League (CPL), 2018.